Our third day in Amsterdam began with a great breakfast of pancakes by Gianmarco as everyone got prepared for another day of playing. (It’s become a common theme that during our travels we feel that all we do is eat.) We stopped for a quick, yet delicious lunch at Café t’Centrum in Amsterdam on our way to Waalse Kerk in Amsterdam to get us through the next six hours. After our trek through the Red Light District, we arrived at our destination! Jacques van Oortmerssen intriguing us with his stories about Waalse Kerk. We met Jacques van Oortmoorsen at the Waalse Kerk. The church is located in the oldest part of Amsterdam, past the Red Light District. The church was founded in 1409, originally built very small. However, due to a period of economic prosperity in trade, the church was expanded. 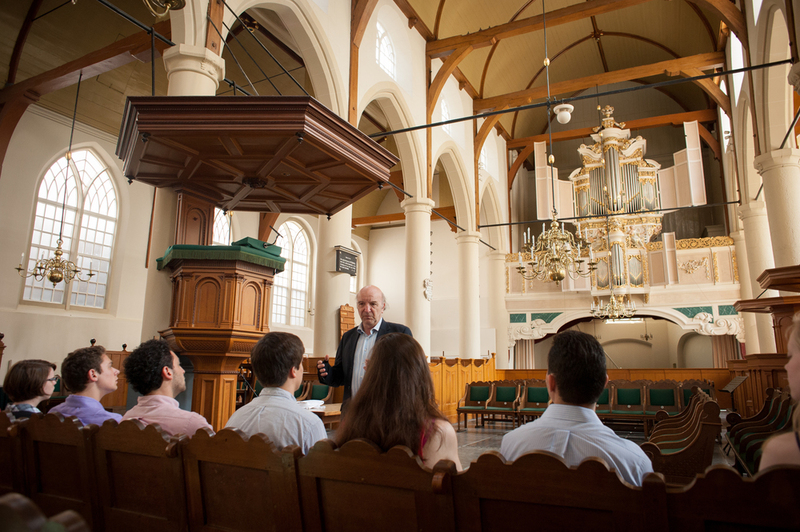 Originally at Waalse Kerk, organs weren’t used during the church services. The church was the communal, cultural building for the city – home of artists, composers, and painters. Special police monitored the activities in the church at that time. The church was within three blocks of the home where Sweelinck once lived. In 1578, the religion of the church changed from Roman Catholicism to Protestantism. The organ of the Waalse Kerk was built in 1680. It was that same year that the city council in Amsterdam made a decision that the organ could be played during the services. At the time when the organ was built, 90% of the expenses were the materials for the organ while 10% of the materials were the labor. Today, the opposite it true. Before we began our organ playing, Jacques told us a story of how Marie-Claire Alain was playing a televised organ concert. Jacques was turning pages for the concert, and Marie-Claire’s husband placed cigars in the mouth of every angel at Poiters. Jacques told us how the audience who watched the concert were amazed at the “beautiful” angels! Jacques told us the type of repertoire we play on specific instruments should match the type of organ we play. As organists, we should listen to how an organ wants to be played. When playing flat pedal boards, it is so important to have solid technique. He talked about an exercise in holding your arms up, but to feel totally and completely relaxed. Oftentimes, excluding the element of relaxation in our playing translates as stress and tension in the body. In turn, the stress is very present to the listener. We should feel relaxed in our playing as if our hands were relaxed at the side of our body. Our pedal playing should consist of the weight from our legs. Attack – Fast attack produces a “t” sound. A slow attack with steady weight to the key allows the pipe to produce a “d” sound. Most often we want to produce a “d” speaking sound. However, there are times where a “t” sound could be desirable. It all comes down to the desired sound the player wants to convey within the music he or she plays. release – The release is just as important as the attack. A quick release instantly closes off the pipe. This sometimes can make long melodious lines to sound chocked. However, a slow, thoughtful release leads to a smoother ending articulation to the note. Jacques talked about Bach’s playing. It was said that Bach could match the same articulation of a subject or motif in feet as played in the hands. When we as organists play Bach, we should strive to match the same structure in whatever voice the subject appears. We talked much about the importance of tempo. Tempo is very strong in the language of pop music. Having a solid tempo is so important for the listener. It’s vital to give a clear indication of the measure. Allow the downbeats to be the downbeats of the beat. In between the downbeats, it is important to allow the musical line to have a sense of freedom. Ultimately, we should aim for a good balance of tempo and meter. Jacques told us if we can learn to read, we can speak. If we can learn to speak, we can sing. And if we can learn to sing, then we can play. aren playing “The Wedge” Prelude by Bach during the masterclass with Jacques. He discussed the dynamics of motifs. It is important to understand where a musical line is going. Allow each note to have its own particular characteristic. Be convincing of the motif. We talked about the works of Bach that were “terrible in the sense of subject.” Jacques was referring to the darkness of some of Bach’s pieces. G, E, and C minor are among those keys. Bach told us how “The Wedge Prelude and Fugue” was about the death of Jesus Christ. This is obvious due to the minor key, chromaticism, dissonances, the descending lines (whether in hands or pedals), the syncopation – weight within certain parts of the melodic lines. We talked about how many of Bach’s pieces symbolize the Trinity. The emphasis in beat one of a measure, beat two in the next measure, and beat three of the next measure oftentimes implies the Trinity. The first beat symbolizing God the Father, the second beat symbolizing God the Son, and the third beat symbolizing God the Holy Spirit. Overall, it was a very informative masterclass – not only for those who played – but for those who were listening in the audience as well. Michael Hedley showing us the beautiful organ at the Basilica of St. Nicolaas! he Harvard Organ Society at Basilica of St. Nicolaas in Amsterdam with Michael Hedley! We then went to play the German Romantic organ at the Basilica of St. Nicolaas here in Amsterdam. It is the largest German Romantic organ built in Holland. It is considered the most important German Romantic organ built in the area. The console can be easily registered straight across each row of stops. It is the perfect instrument for playing Schumann, Liszt, or any other German Romantic composers. The organ is very warm in sound, much like a supersized, symphonic Skinner – with a warmth of smooth, liquid sound that blended so well with the acoustic like I had never heard before. 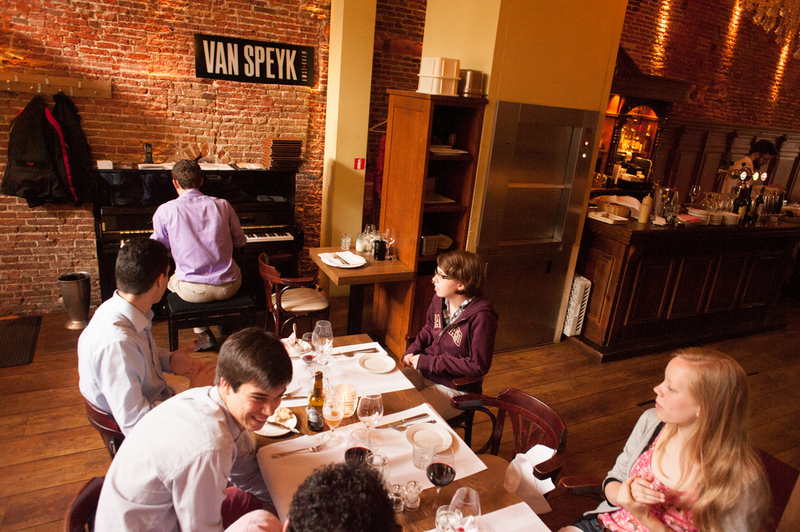 After leaving, we went out to eat at Van Speck, a place that Jordan picked out. Our waiter was hilarious, and a few of us entertained both the servers and restaurant patrons on the upright piano in the restaurant. Overall, the day was full of learning, wonderful food, and great company!